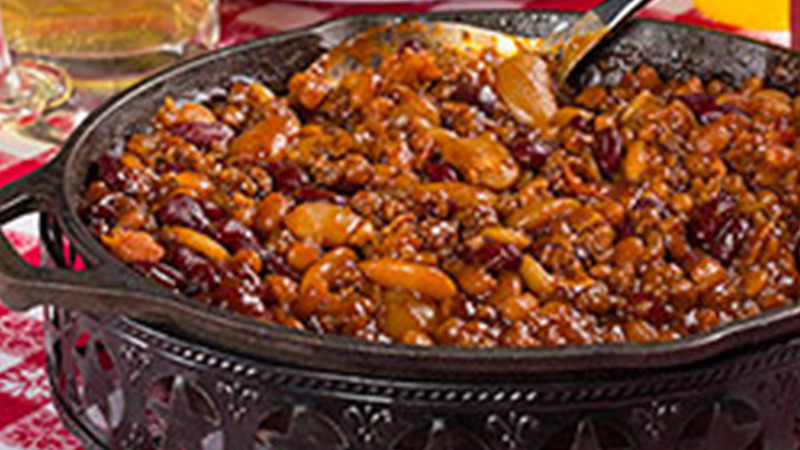 Nothing is more down-home than the wonderful flavors of backwoods country cooking, so it's only fitting that these Hillbilly Baked Beans are one of our most popular slow cooker potluck recipes. They can even be reheated on a grill for a smoky taste that can't be beat! 1. In a 5-quart slow cooker, combine meat, onion, barbecue sauce, brown sugar, and water; mix well. Stir in remaining ingredients and cover. 2. Cook on HIGH 4 hours or on LOW 6 hours. Serve immediately. If you're having a backyard barbecue, you can serve or reheat these in a foil pan or cast iron skillet on your grill. And you can make these in the oven, too. Just put the mixture in a 3-quart casserole dish, cover, and cook in a 350 degree oven about 1-1/2 hours, or until hot and bubbly.